Give to the Max Day - Support community leadership! 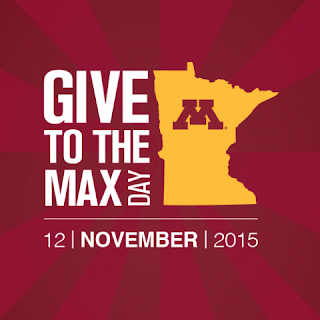 Give to the Max Day, Minnesota's annual giving extravaganza, is November 12. You can support Extension Leadership Programs by visiting the University's giving portal at https://givingday.umn.edu/ and choosing to "Give Now." By using the University's site, know that 100% of your gift will go to support the program of your choice - there are no administrative fees! Extension Leadership Funds include the Patricia and Francis Buschette Leadership Fund (statewide support) and the Vijay Sethi Leadership Fund (northwest Minnesota support). If you have questions about Give to the Max, or about giving any time through the year, contact Jane Johnson, Extension development director. To learn more about how gifts to Extension research and education can make a difference in Minnesota, visit the Donate to Extension website.